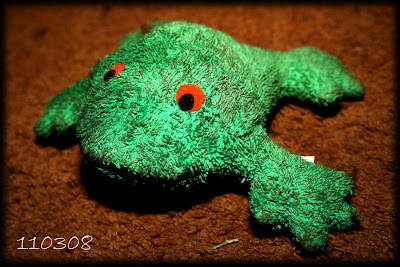 This is Martha's slobbery frog toy... (he's sitting on a dirt-trapper mat... that's not my carpet!) he's made of towling, so extra absorbant... like a toy and slobber cloth in one! Martha loves him and enjoys flailing him about and throwing him up in the air. I'm waiting (not very) patiently for my Studio Calico kit to arrive. Last month it was here on the 11th so i'm going to be stalking the postman, particilarly as he's also still got my monopod and my battery grip! Come on Postie! !